This 2014 paper discusses a theory of accommodation (eye focusing) that should be of interest to anyone familiar with the Bates techniques of natural vision improvement. Scientists have discovered a previously unknown layer lurking in the human eye. very front of the human eye that helps to focus incoming light, researchers say. Attached is an interesting study regarding "Astaxanthin" in the neuro protection of retinal cells (which could have implications for glaucoma). This was forwarded to me by a fiteyes member. A little research shows that there are some micro algae based supplements for obtaining this - In light of modern toxins, I am a little hesitant with consuming the amount of seafood that is probably necessary for getting this naturally in the diet. Thank you for enrolling me as a member of FitEyes. My eye pressure was 18/19 during 2008. Doctor said not necessary to apply drops but to be careful with my diabetic. But presently my eye pressure stands at 21/22. This happened as I travel in a coach in the whole night where there was a television playing movie inside a bus. When I reached the destination I found my vision was not alright. So be carefull watching tv in a moving vehicle. Toronto, Oct 6 (IANS) Cure for glaucoma which leads to blindness may be on its way. Canadian researchers have discovered an unidentified form of circulation in the human eye which may provide important clues to glaucoma. The human eye is considered to lack lymphatics – a circulation responsible for pumping fluid and waste out of tissues. But now researchers at the Universityof Toronto and the local St Michael’s Hospital say the inability to clear that fluid from the eye is linked to glaucoma which currently affects over 66 million people worldwide. My husband does not have glaucoma but Monday when he woke up his prescription for eyes have drastically changed. He went to eye doctor yesterday and was told it is just age (he is 64 and works a lot on the computer) he was told prescription just needs changed. 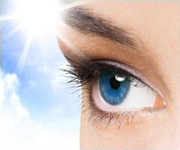 What would cause a dramatic change in your eyes? The human eye is a perceptual powerhouse. It can see millions of colors, adjust easily to shifting light conditions, and transmit information to the brain at a rate exceeding that of a high-speed Internet connection. Over the last several years, original research conducted by FitEyes.com has supported the observation that our internal state (which largely consists of our thoughts and emotions) is fundamentally related to the health of our eyes. Our physical health and our state of consciousness are intimately related and each can influence the other. However, in our model of health,consciousness is primary. What is Eye? Eye is the official journal of the Royal College of Ophthalmologists. It aims to provide the practicing ophthalmologist with information on the latest clinical and laboratory-based research.